(Nanowerk News) The storage capacity of concentrating solar power (CSP) can add significant value to a utility company’s optimal mix of energy sources, a new report by the U.S. Department of Energy’s National Renewable Energy Laboratory (NREL) suggests. 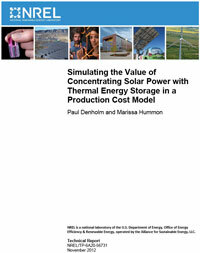 The report, “Simulating the Value of Concentrating Solar Power with Thermal Energy Storage in a Production Cost ModelPDF” (pdf) by NREL’s Paul Denholm and Marissa Hummon, noted that the $35.80 per megawatt extra value would come in a scenario in which there is relatively high penetration of renewables into the utility’s mix, about 34 percent. If the penetration was lower, the extra value would be lessened. The authors simulated grid operations in two balancing areas primarily in Colorado. NREL is also using the same methodology it developed for the Colorado scenario for the more complex California system controlled by the California Independent System Operator. A report on the value that CSP with thermal storage adds to the California system is expected early next year.